I’ve only ever had sweet pongal until I tried Venn Pongal in Chennai. I never liked sweet pongal and would usually refuse at the dinner table. When we were in Chennai, due to some planning issues, we were stuck before our next flight at 5 in the morning and the only thing the hotel had ready for breakfast was pongal. The last thing I expected when it arrived was a lovely spicy pongal! Mangy and I couldn’t get enough of it. That’s one meal I will never forget as the hotel absolutely refused to charge us for breakfast. They made sure we were well looked after, even at 5am. Thank you Accord hotel! 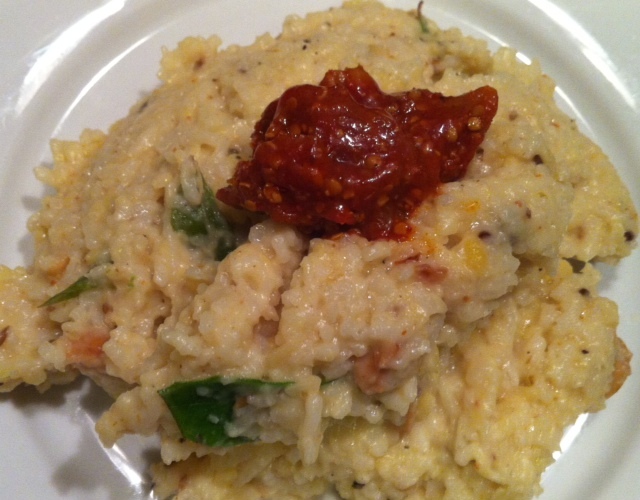 Spicy pongal is now a staple at home and personally I prefer it over over Kichadi. It is the ultimate comfort food and I really struggle to stop at just 1 serving. Mangy and I usually go through the entire pot in one sitting! I prefer powdering the black pepper and cumin seeds, I find biting into the peppercorns detract from the comfort of the pongal. But it’s up to you, you can leave the seeds whole. In a large pan, heat gingelly oil, add onions, chilli and hing. Fry until onions are soft. Add ginger and garlic paste and fry well. Heat another tablespoon of oil, add cumin seeds, black peppercorns, mustard seeds and methi seeds. Add curry leaves and dried chilli. Stir well. Pour a glass of water into the pot if the ginger and garlic start to burn. Add cooked rice and dal. Add sambhar powder, fish curry powder, turmeric powder and roasted black pepper and cumin powder. Stir well. Add milk and salt to taste. At this stage, you can pressure cook this for 1 whistle if you like a softer feel of the rice. Or you can skip the pressure cooking if you prefer the rice a little less mushy. If you are pressure cooking, add another glass of water before pressure cooking. Once cooked, add roasted cashew nuts, butter, fresh ginger and coriander leaves. Serve Pongal with pickles.